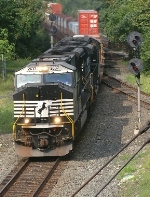 Description: NS Westbound Freight Train at Irondale, Al. 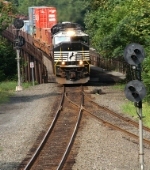 Description: NS Westbound Freight Train yarding their train at NS'S Norris Yard in Irondale, Al. Description: NS 2637 and Ex UP coming at you! Description: Another look at the undecorated SD70M through Grover, NC....This train was moving!! Description: NS stack train 24Z rolls east by Port Reading Junction behind an albino, or primer SD70M on a fine morning. 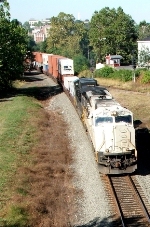 Description: An NS SD70M in primer and another NS widecab pull an intermodal through Lyons, PA. Title: EB I4Z @ 1022 hrs. Description: NS i4z heading for the "top"
Description: Ghost SD70M leads #24Z at P.Burg, NJ this morning. Description: 17G west on #2 through Penn with a primer C40-9W trailing. Description: I lost sight of the guys as the train got closer at track speed. I thought for sure this picture would be police evidence! Description: NS intermodal train 20E cruises eastbound on track 1 around the bend under the bridge at Perkiomen Junction in the Valley Forge area on a bright morning behind a pair of SD70M variants. Description: 24V crosses the Delaware River on the former CNJ bridge and enters the Garden State. Description: NS detour after the ethanol train disaster in western PA. Description: NS 21M passes through the signal bridge just east of Cresson. Description: NS engines 2637 and 7517, both in horse head paint, await their crew. Description: Roster shot of 2637. Description: My favorite NS locomotive model.